Prof White has again received the Duke Medicine Golden Apple Award for Pre-Clinical Science Faculty in 2018. In 2016 prof. White has also received it that prize. See Teaching Award for Prof. Len White. The Preclinical Golden Apple award is an award for the recognition and appreciation of outstanding dedication to medical student education. The Golden Apple is the most prestigious teaching award given by the medical school student body to recognize physician-teachers that the medical students feel have played an exceptionally effective and dedicated role in their education. This honor is reflects the nominations and votes of all four classes of medical students.. The award was won by prof. White in 2016 and can’t be won in two consecutive years, so prof. White could not win in 2017. The most important core concept you will learn in medical school is … that the brain is the most complex organ of the human body! This award was given in a small ceremony during the intermission of their annual musical theater event. Prof. Len White also got to play a small part in that show. He played himself in a scene making fun of the integration of medical education across disciplines. 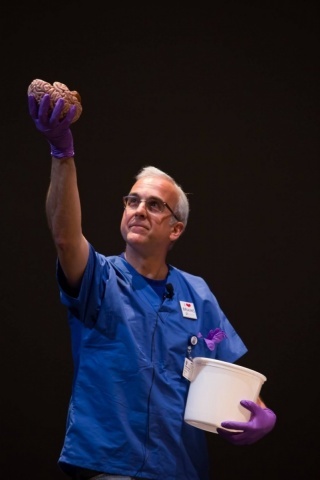 His line was “the most important core concept you will learn in medical school is … that the brain is the most complex organ of the human body!”; He pulled a brain model out of a white bucket while reciting this line, very familiar to us MOOC learners, which seemed to illicit quite a response of laughter and applause from the audience. He also played guitar in the student-faculty band that played a number of American 1950s-60s popular songs (“Rock Around the Clock”; You Ain’t Nothin’ But a Hound Dog”; “Twist and Shout”; “The Girl from Ipanema”) before the show and after the official start of the show and during intermission. Prof. White’s is a recognized expert in the structure of the human brain, the organization of the visual parts of the brain, and the influence of experience on brain development in early life. He is a co-author and co-editor of a major textbook of neuroscience ( Neuroscience 6th e. Purves et al.) and a digital atlas of the human central nervous system (Sylvius 4 online). He is well-known for his dedication to students of all levels, extraordinary knowledge base, and his commitment to the field of Neuroscience. Prof. White teaches students on Duke campus in Durham and Singapore by a concept of “flipped classroom” team-based learning (see for a sample of this team-based learning this video . This form of teaching gives the students a very active role in their learning process. This approach to teaching is greatly appreciated by students as is assessed by end-of-course customized NBME exam. In addition to teaching in the medical students and undergraduates, prof. White teaches a well-regarded, free Massive Open Online Course through Coursera. The course Medical Neuroscience that has ran since 2013 . More than 200,000 learners from 193 nations enrolled (70% reside outside the U.S.) in Medical Neuroscience. Learners came from all walks of life (58% were female; 42% spoke English as the first language); they spanned the educational continuum from pre-baccalaureate students to professionals with terminal degrees in the medical and science professions; and they spanned the age range from teenagers to septuagenarians (63% were 18-34 years old). The course provides a platform for implementing “flipped classroom” team-based learning in the schools of medicine at Duke and Duke-NUS. As one MOOC participant, who gave the course a five-star rating, noted: “Dr. Len White is a brilliant teacher. His subject is difficult but his tutelage is thorough. … His pedagogy sets a standard and is demanding but oh so rewarding”. If you enjoyed the excellent teaching by prof. White you can return the favor and review the course on well visited sites. You can read how to do that in this article: Review Medical Neuroscience.